My family is waffle obsessed. James is the breakfast maker in our house, and for the past nine months or so, Ella has asked for waffles every single Sunday. Not just any waffles, but the waffles from the Joy of Cooking, which, I’m told, are perfectly buttery and crispy. How would I know? The suckers are gluten-filled, and even though we’ve tried to make them gluten-free, Ella can taste the difference and begs (i.e. whines like hell) for the original. We usually give in, and I’m left pulling something out of the freezer if I’m lucky, or resorting to a bowl of porridge or granola. 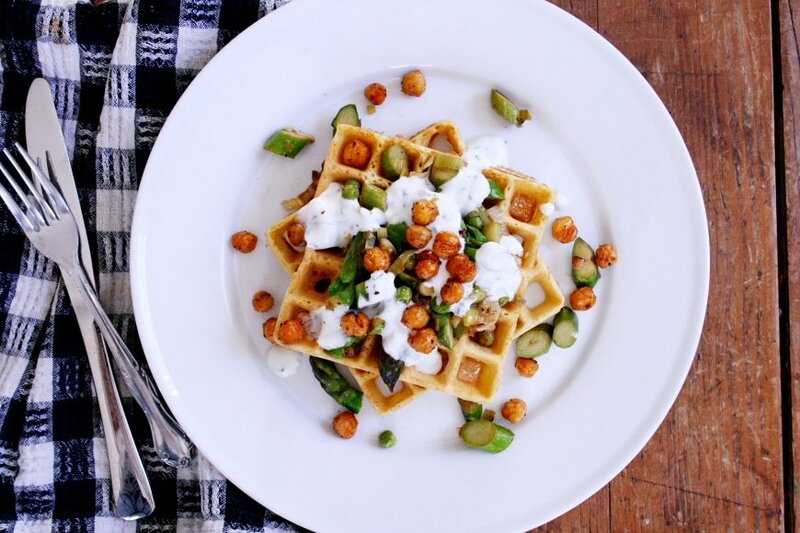 I will give them breakfast, but there’s no way they’re getting dinner too—I’ve reclaimed my waffle prerogative at supper with these delicious chickpea waffles. Instead of the sweet waffles of morning, in the evening I want something savory and satisfying. 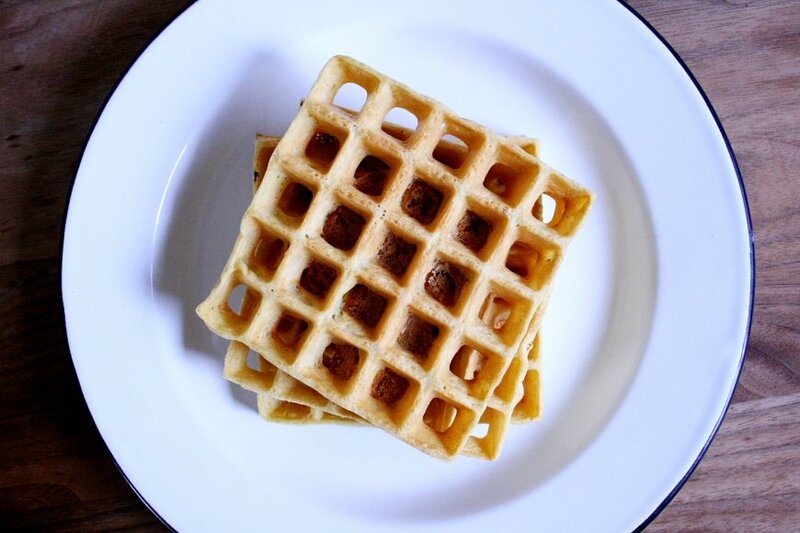 Enter chickpea waffles. I first started making chickpea socca, which is a thin, crispy, simple flatbread made with chickpea flour, water and olive oil a couple of years ago. This recipe became a springtime favorite, enjoyed on the front porch with a glass of rosé as an appetizer. Then I became obsessed with these chickpea fries (panelle) which, trust me, will change your life. From there I came across a recipe for socca waffles and became instantly hooked. They’re the easiest waffles you will ever make, consisting of a mere 4 ingredients, with a batter that comes together in seconds (watch the VIDEO below!). While it’s definitely a fast recipe, it does require a bit of advance planning, as the batter needs to sit for an hour to allow the flour to absorb the liquid. 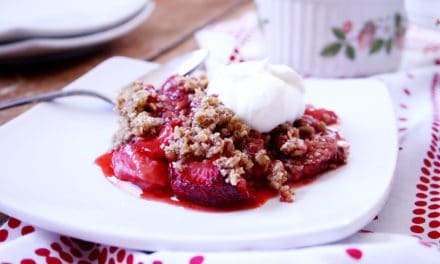 However, it can sit out all day long so I whisk up the batter in the morning after breakfast; leave it on the counter; and it’s ready for me come dinnertime. While it’s hard to resist eating the waffles on their own straight out of the waffle maker, I prefer to turn them into a meal by piling them with savory toppings such as sautéed vegetables, fried or poached eggs (bacon optional), or even a mix of leftovers. 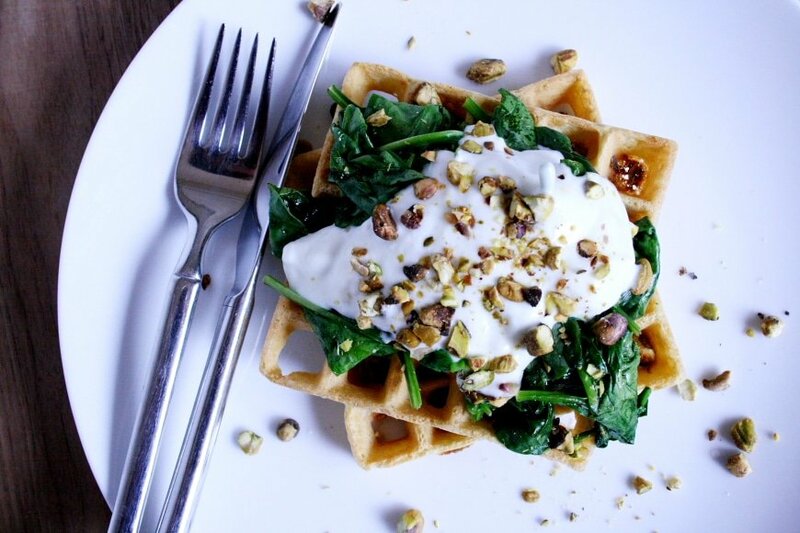 If I’m short on time, one of my favorite variations is to top the waffles with sautéed spinach, a dollop of plain yogurt, some flaky sea salt and a smattering of chopped pistachios. If I have more time, I’ll gussy things up with a mix of sautéed vegetables (any will do, but right now I’m into leeks, asparagus and peas), a drizzle of mint-flecked yogurt, and crispy chickpeas. The chickpeas are a staple around here, which we eat on salads or as a snack straight off the pan. They’re delicious with the waffles, and I get a strange satisfaction out of the fact that I’m serving chickpeas two ways (probably because it allows me to say, “it’s double the fun!” much to the eye rolling of my family). So what if I can’t have waffles at breakfast? I like them better at dinner anyway. This is definitely a fast recipe, but it does require a bit of advance planning, as the waffle batter—which is made with only 4 ingredients takes less than 5 minutes to make—needs to sit for at least an hour. I usually whisk the batter together in the morning after breakfast; that way it’s waiting for me come dinnertime. The crispy, nutty waffles are awesome on their own as a side dish, or they can be turned into dinner by topping them with a fried or poached egg and/or with vegetables. One of my favorite ways to eat them is with sautéed spring vegetables, a drizzle of yogurt, and a sprinkle of crispy chickpeas (for twice the chickpea fun). This recipe is adapted from Nicholas Day’s socca waffles on Food 52. 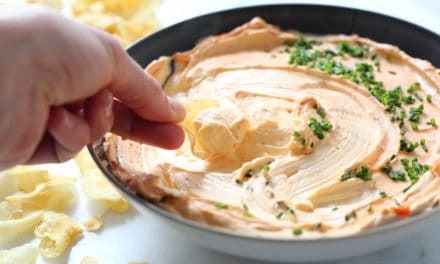 In a large bowl, whisk together the chickpea flour, water, olive oil, salt and sugar until smooth (the batter will be quite thin). 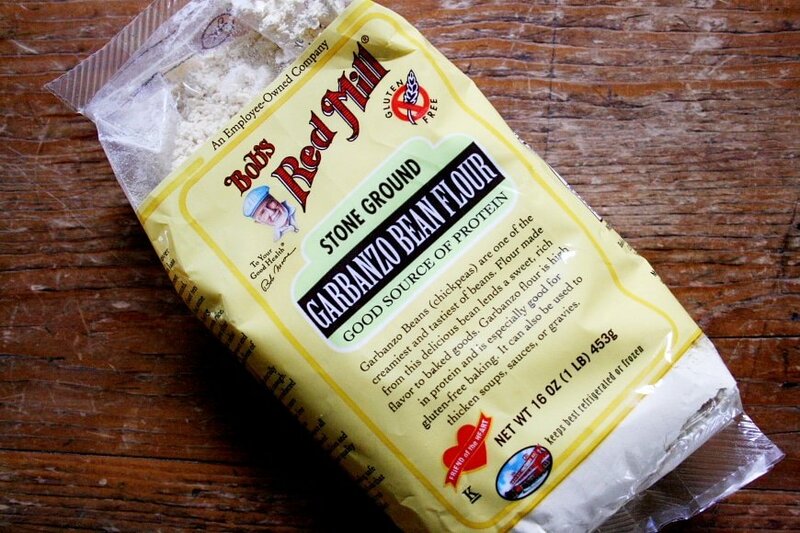 Cover and let sit at room temperature at least 1 hour, or up to 9 hours. Do Ahead: The batter can be made up to 9 hours in advance. Store at room temperature. Brush the waffle iron with a bit of olive oil or spray it with cooking spray. Working in batches, cook the waffles until golden and crisp. Serve immediately. Do Ahead: The waffles can be kept warm in a 200˚F oven for 15 minutes. 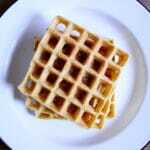 Once cooled, the waffles can be stored between layers of parchment or wax paper and frozen for up to 2 months. Reheat in a toaster oven. These crispy chickpeas are awesome on their own as a snack, or sprinkled over salads or chickpea waffles! Preheat the oven to 450˚F. 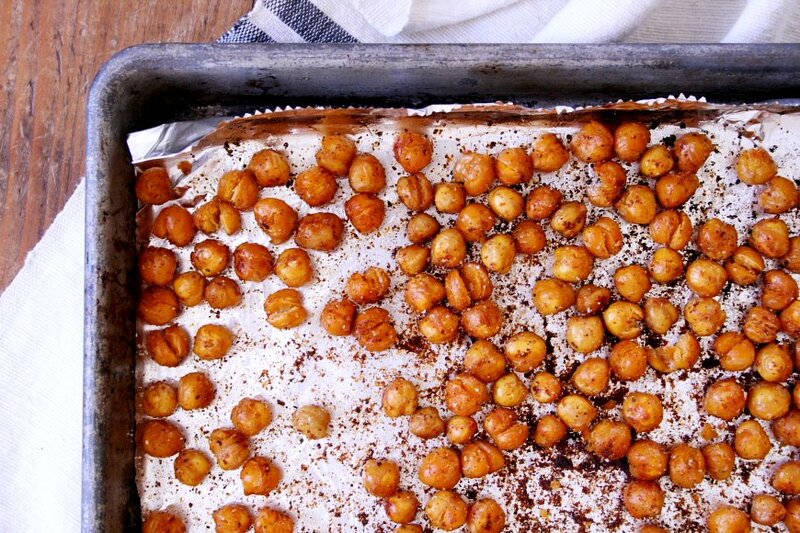 Spread the chickpeas on a small baking sheet and sprinkle with the smoked paprika, garlic powder and sugar. Season with salt and pepper. Drizzle with the olive oil and toss well to coat. Roast 15 minutes, shaking the pan twice during cooking, or until the chickpeas are crisp and starting to split. As soon as they come out of the oven, season with more salt and pepper. Do Ahead: The chickpeas can be made up to 2 hours in advance. Store uncovered at room temperature. These recipes look great, thanks for them! 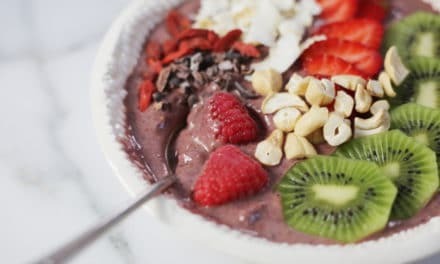 While I’m not gluten (or dairy or anything-else free, I am looking for ways to eat more healthy protein and cut down on my meat consumption). I’ll be trying these this week! Thanks so much for visiting, and I hope you enjoy!! 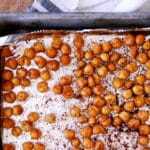 The crispy chick peas are a great snack. 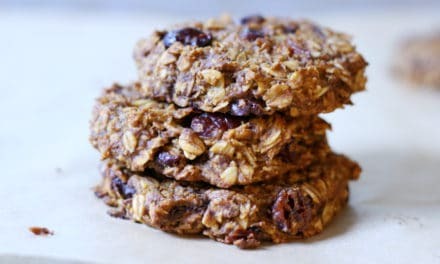 Absolutely guilt free and sooo good. These look great! Do you have any tips for how to keep the batter from sticking in the waffle iron? Do you tend to do these low and slow, or higher setting? About how long do they typically take per waffle? Thanks, can’t wait to try this savory version. Thank you! I suggest spraying the waffle iron with cooking spray to prevent sticking. I’ve never had trouble with the batter sticking, but our iron is well seasoned (we use it a LOT)! You’ll want to cook the waffles on medium-high, and the time will depend on the waffle maker you have. Just keep your eye on them. Once they’re golden and crisp, you’re ready to go. Good luck, and I hope you enjoy!